Perhaps it was just one of those ‘dog days of winter’ performances. 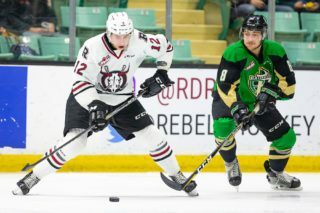 Whatever the case, the Red Deer Rebels were a listless team through most of the first two periods of Wednesday’s WHL contest at the Centrium and despite cranking it up in the final frame, fell 4-0 to Brandon Wheat Kings. 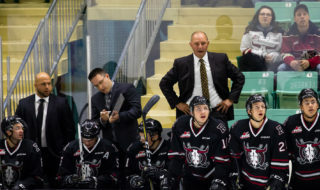 “I didn’t think we played very well, we didn’t have enough guys play well for us tonight,” said Rebels GM/head coach Brent Sutter. The Rebels managed 11 shots in the first period but didn’t create much, while the visitors struck for the lone goal when Ty Thorpe stripped the puck from Rebels defenceman Hunter Donohoe and from the side of the net snuck it past netminder Ethan Anders. The Wheat Kings doubled their lead midway through the second period as Braden Schneider’s point shot glanced off a Rebels defender and past Anders. “The second goal they got, we just talked about it right before, during the (mid-period) timeout, about making sure we get pucks behind the defence to allow us to forecheck and get our feet moving,” said Sutter. 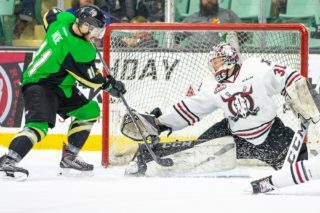 The Rebels didn’t help themselves in the middle stanza, directing only three shots at Wheat Kings affiliate netminder Connor Ungar, who was called up from the AJHL and has appeared in just one game with the Okotoks Oilers this season. In the end, Ungar turned aside all 34 shots he faced in his second outing with Brandon and was rightfully selected as the game’s first star. ‘We chased the game a lot in the first two periods, and again our power play is killing us,” Sutter said of his club’s man-advantage units, which — without the services of injured rearguard Alex Alexeyev — have struggled lately and were zero-for-five Wednesday. “We’re not getting any production out of our power play and it’s a reflection of your top players. The Rebels carried the play through the final 20 minutes, outshooting their guests 20-11, but couldn’t solve Ungar, who got some big-time shot blocking from his defencemen. 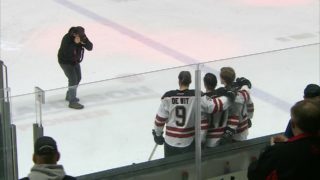 Red Deer’s inability to cash in during the third period was also due to a lack of puck luck, several outright misses and a hit post by Brandon Hagel following a give-and-go with Oleg Zaytsev. Ungar, to his credit, came up with an excellent diving stop on a one-timer by Reese Johnson late in the game and was worthy of the shutout. Luka Burzan pretty much finalized the outcome when he want hard to the net and deflected a feed from Stelio Mattheos at the 17-minute mark of the third. It was Brandon’s lone power play tally in five opportunities, but it was one more than the Rebels managed. “You have to have your power play generating offence and momentum for you. We just haven’t produced on it like we need to,” said Sutter. Caiden Daley rounded out the scoring with an empty net goal at 19:38.
Notable: Anders finished with 25 saves, and with the exception of the first goal was stellar while making a handful of top-flight stops . . . Attendance was 3,489 . . . The visitors swept the three stars, with Schneider the second star and Mattheos the third . . . 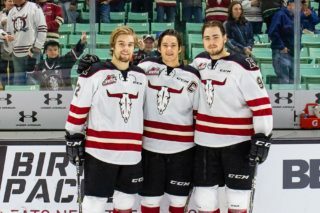 The Rebels will meet the Hurricanes Friday in Lethbridge and will host the Calgary Hitmen 24 hours later . . . Long time Rebels billet mom Val Wisener was honoured prior to the game, with a number of former players congratulating here via video for being the recipient of the ‘A Beautiful Woman’ award.